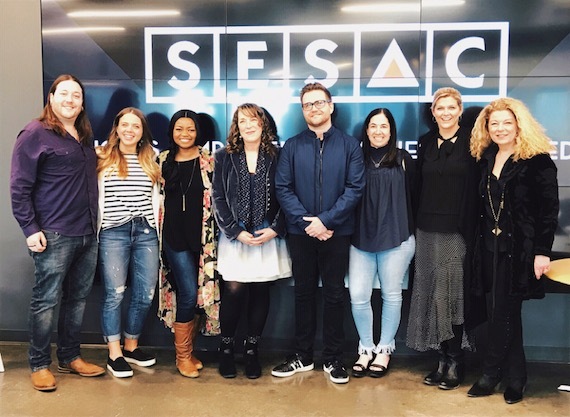 The release party for Beth Nielsen Chapman’s new Hearts of Glass album was staged at SESAC on Wednesday, April 11. One of those that she performed at the event is the album’s philosophical “Old Church Hymns and Nursery Rhymes,” originally recorded by Waylon Jennings in 1990. Among the new tunes she sang is the sunny “Enough for Me,” which she co-wrote with Sam Ashworth. He produced the album. Ashworth joined her in performance on guitar and backup vocals. On percussion and backup vocals was Ruby Amanfu, whose credits include CDs by Beyonce, Jack White and Bruce Cockburn. The release party for Hearts of Glass marked the first time that Chapman had been in the new SESAC edifice. The release party was attended by a number of her fellow singer-songwriters, including Gail Davies, Bill Lloyd, Mary Gauthier and Chris Scruggs. Beth Nielsen Chapman will showcase on the Grand Ole Opry this Saturday, April 14.